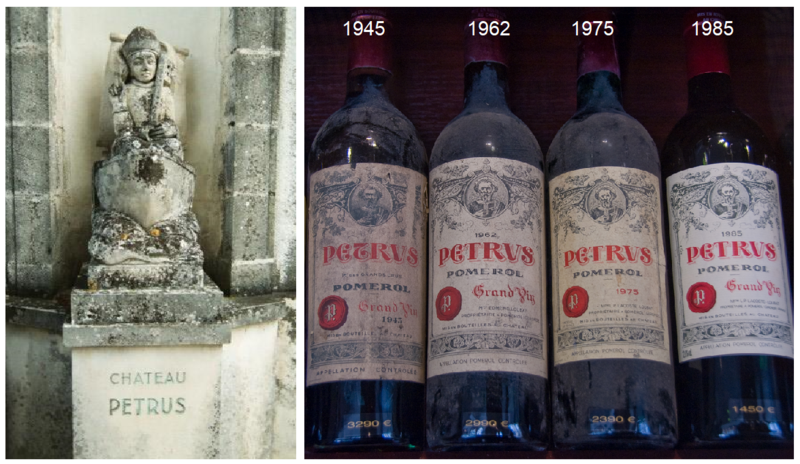 Château Petrus, Pomerol is not a member of Wein‑Plus yet. By creating Château Petrus saved filter, you will see relevant matches on your home screen. The winery is located in the heart of the community Pomerol in the area of the same name ( Bordeaux ). In the winery is a small stone figure of the eponymous apostle. Although it won a gold medal at the World's Fair 1878 in Paris, but internationally, the winery was little known for a long time. This changed abruptly with the year 1945, which as Wine of the century applies (see a bottle in the picture). In 1925, the operation was partly owned by Marie Louise Loubat (+1961) and was fully acquired by him in 1949. At that time, the vineyards covered 6.5 hectares with the varieties Merlot (70%) and Cabernet Franc (30%). Jean-Pierre took over this year Moueix (1882-1957) the exclusive distribution for the wine. After the owner's death in 1961, Moueix acquired a third of the shares, the other two inherited Lily Lacoste (niece of Madame Loubat). In 1964 Moueix acquired further shares to now two-thirds. After the death of Jean-Pierre Moueix took over 2003 son Jean-François (* 1945) the leadership, whose brother Christian (* 1946) directs the production. The vineyards increased in 1969 through the purchase of 5 hectares of the neighboring Château Gazin on a total of 11.5 hectares of vineyards. The grape stocking was reduced to 95% Merlot and 5% Cabernet Franc changed. This red wine is one of the best and most expensive wines in Bordeaux and also the world. The vintage 2000 cost in 2010 (after ten years you should open it at the earliest) between € 3,500 and € 3,800. The well-known wine journalist Hugh Johnson commented: "Incomparable - but unfortunately only for millionaires" . In Pomerol there is no own Grand Cru classification but he is undoubtedly the top crop and the five Premier Cru Classé in the Médoc at least equate. On the label today stands only "Peter", on old labels but is still very well "Château Pétrus" (there is no chateau = castle). Even in good years, no more than 4,000 cases (~ 50,000 bottles) are produced. The gritty sand-clay soil on a bed of ferrous soil with extra good water discharge creates excellent conditions. This is ideal for Merlot, from which the wine is vinified at 100% for most vintages. Another criterion is the up to 70 year old vines. And a third point is the extreme yield restriction. When winter cut are on each vine only eight eyes leave (already two more would increase the yield by a quarter). In summer, another restriction is made by rigorous thin out to around half. The special attention is given. A total of 180 harvest workers are available on call. The start takes place when the grapes are the ideal physiological maturity achieved. It starts only in the afternoon so that the dew (which could dilute the must) has already evaporated. The harvest takes place in several passes of each ripe grapes. Immature and unhealthy grapes are excreted mercilessly. If necessary, unusual methods are also used. Once it rained before harvest, a low-flying helicopter was used to dry the vines. The expansion takes 18 to 22 months in 100% new oak barrels. In doing so, find ongoing sensory Tests take place, only the best barrels go into the Grand Vin, A special feature of the dark and incredibly concentrated red wine is the low acidity, which makes it soft, round and supple. Despite its high tannin content, the wine is tender and oily, which you can literally bite and chew. It is attested to aromas of black currants, blackberries, mulberries and plums, which have become associated with the years tobacco notes should join. As already mentioned, the wine should not be opened ten years ago at best, its shelf life is 30, 40, 50 years and longer. It is actually a wine that one should bequeath to his heirs after the purchase. Particularly outstanding vintages were or are 1964, 1967, 1971, 1975, 1978, 1979, 1981, 1982, 1983, 1985, 1986, 1988, 1989, 1990, 1995, 1996, 1998 and 1999. In the mid-1990s, the winery hit the headlines of the wine-oriented trade press, as the famous wine-lovers couple David Peppercorn and Serena Sutcliffe the authenticity of Imperial bottles of the Château Pétrus vintages of 1921, 1924, 1926, 1928 and 1934, owned by the well-known collector Hardy Rodenstock (1941-2018), which were offered for sale. The suspicion was never proven, but also not refuted, because there are no production records on the part of the winery over these vintages.